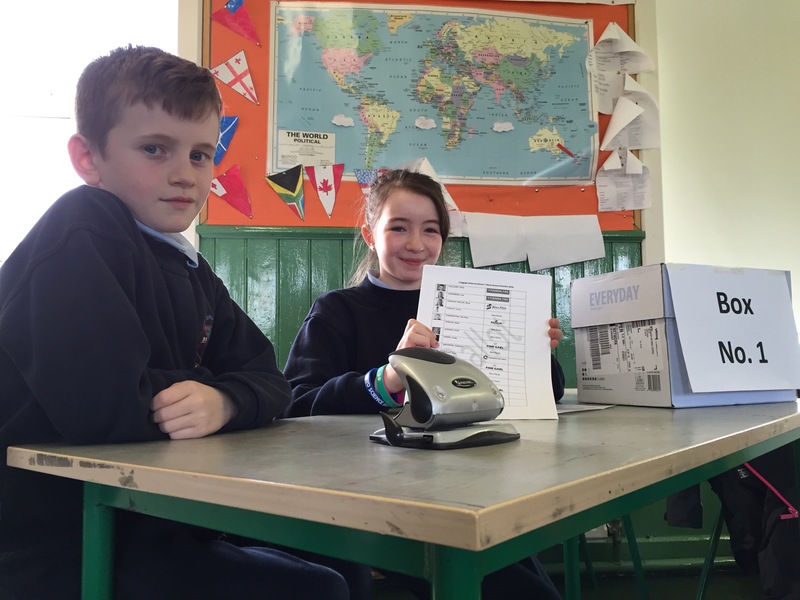 Election fever in Craggagh NS! We love elections! 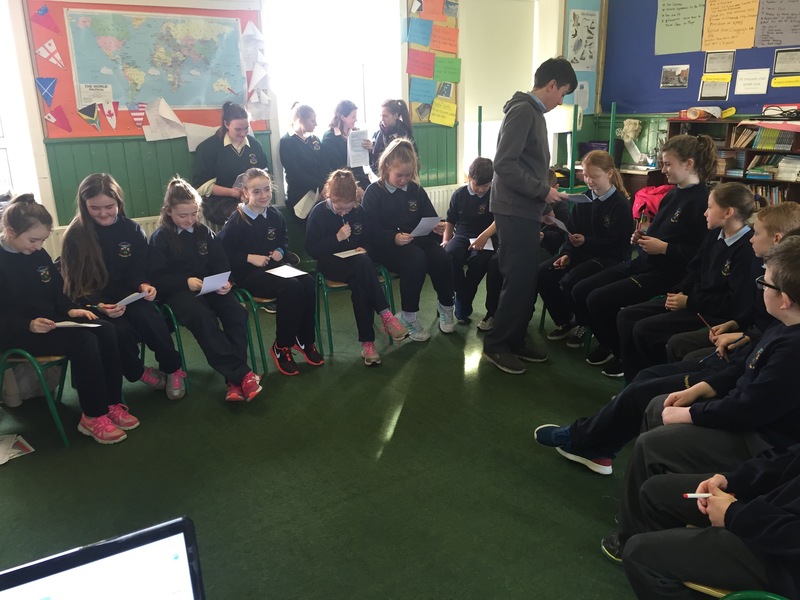 On Thursday, 24 hours before the real thing, the children of Craggagh NS had their say on Election 2016, casting their votes on our Mock Election. We went through the full PR count process, electing our 4 candidates after a gruelling 6 counts. Perhaps unsurprisingly, the children’s vote was almost identical to that of their parents! We have looked at tally figures from the real election and the results from Craggagh NS match the children’s poll with Chambers receiving the most first preferences, followed by Kenny and local man Michael Farrington. In the real thing, M Ring came 4th, whereas the children had M Mulherin in 4th position. Just before polling began, local Renua candidate Michael Farrington arrived and made a last ditch appeal for some votes! He received a particularly stern examination from the Junior Room where the children pressed him on the prospects of a swimming pool for Craggagh and a 50,000 seater football stadium. Farrington remained coy and non-committal. His canvass clearly had a lasting impact with the youth vote however as a number of Junior Infants were heard saying “I want to vote for the fella’ who came in this morning” as they entered the polling booth. Polls opened at 10:30am and turnout out was high, our presiding officers and clerks were flat out. Early exit polls indicated a strong vote for both Farrington and Lisa Chambers. The polls closed after break and attention then turned to the all important count. Initially, the votes had to be sorted and the spoiled ballots adjudicated on by Returning Officer Anna McDonnell. Chambers’ surplus transferred extremely well to her party colleague Dara Calleary who was eventually elected alongside Farrington. This was a great learning experience for the children. Prior to our mock election we held a number of debates with the children outlining party positions on issues such as Education, Health and Childcare. A number of the candidates engaged with us on twitter throughout the campaign, some of those tweets are posted below. We now hope that they remember us during the course of the 32nd Dáil (however long it lasts) particularly in relation to the position of our small and rural schools. Who knows, we might get to do this again very soon! @CraggaghNS thks for the support! We had a very interesting morning today as we were joined by Ciara, Cillian, Jade, Nicole & Rebecca who are all Transition Year students in St Louis Community School in Kiltimagh. They delivered a lovely lesson on communication skills which went down very well with 4th, 5th & 6 classes. They will return for another 3 lessons, covering important topics such as bullying and Internet safety. No, it’s not €2, look closely! @CraggaghNS Jack in our class is from Thailand – he says it's 10 Baht. 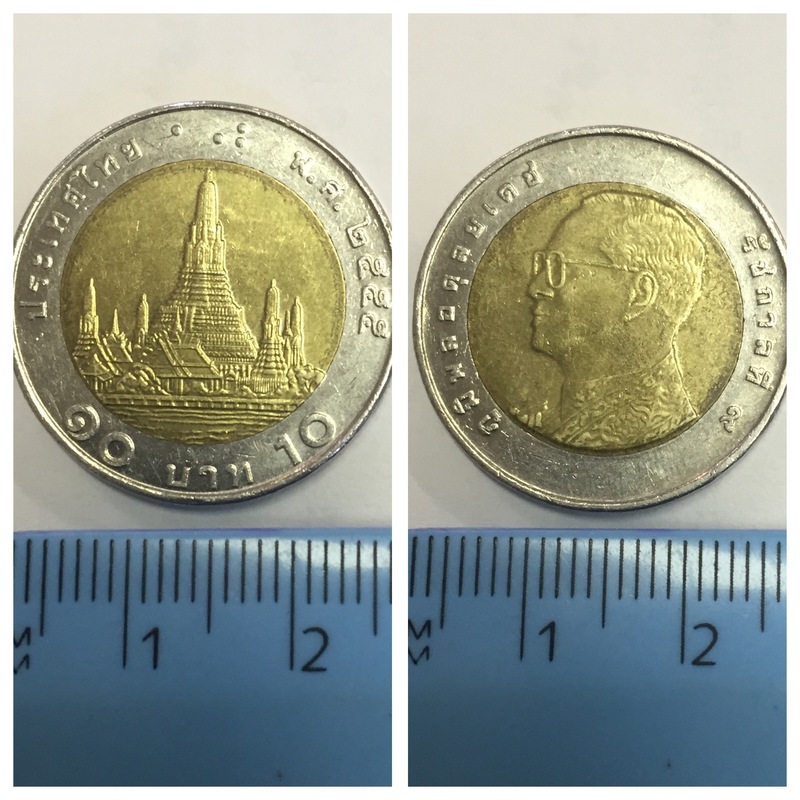 40 Baht = €1, he reckons. @CraggaghNS The writing says Thailand 2555 – their years are different! The guy on the coin is the king. Craggagh NS is currently accepting enrolment applications for the 2016/17 school year. Enrolment forms are available to download or can be obtained by contacting the school on (094) 9365177. We will hold our annual New Infants’ Enrolment Day on Friday, May 27th from 9:30 to 11am. All new infants (and their mammies and daddies!) are invited to join us for an informal morning of activities and fun. Please contact us with any queries or to receive a copy of our new information booklet.